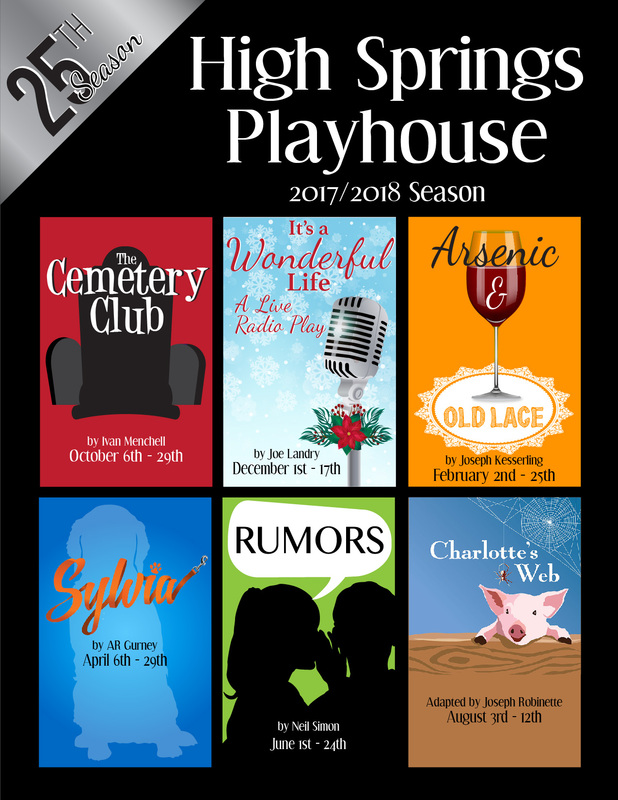 High Springs Playhouse - Let us Entertain You! Our Youth Production put on and played entirely by children ages 8-18! With equal measures of pluck and positivity, little orphan Annie charms everyone’s hearts despite a next-to-nothing start in 1930s New York City. Annie is determined to find the parents who abandoned her years ago on the doorstep of an orphanage run by the cruel Miss Hannigan. Annie eventually foils Miss Hannigan’s evil machinations, finding a new home and family in billionaire Oliver Warbucks, his personal secretary, Grace Farrell, and a lovable mutt named Sandy. The playwright turns on the stage lights and prepares for the first reading of his new play. As the cast and crew assemble, an undercurrent of suspense is evident. Everyone connected with this show was involved with another play, and exactly a year ago on opening night in this theatre, the leading lady (the playwrights fiance) was murdered! As the read-through begins, startling connections to the murder begin to unfold through flashbacks and reenactments. Growing tension reaches the boiling point with surprising revelations and accusations, countered by others even more surprising. The dazzling and logical twists build to a climax and solution that is theatrically stunning! Lend Me A Tenor is set in September 1934. Saunders, the general manager of the Cleveland Grand Opera Company, is primed to welcome world famous, Tito Merelli, Il Stupendo, the greatest tenor of his generation, to appear for one night only as Otello. The star arrives late and, through a hilarious series of mishaps, is given a double dose of tranquilizers and passes out. His pulse is so low that Saunders and his assistant Max believe he’s dead. In a frantic attempt to salvage the evening, Saunders persuades Max to get into Merelli’s Otello costume and fool the audience into thinking he’s Il Stupendo. Max succeeds admirably, but Merelli comes to and gets into his other costume ready to perform. Now two Otellos are running around in costume and two women are running around in lingerie, each thinking she is with Il Stupendo. A sensation on Broadway and in London’s West End, this madcap, screwball comedy is guaranteed to leave audiences teary-eyed with laughter. 2015 All Rights Reserved. Powered by Cyber Studios, Inc.